Support students at risk of completing year 10 through links with external programs that promotes personal growth through community projects. Improve students' ability to develop proactive relationships with teachers and peers across the school through peer support programs. Develop and document learning programs which are available online, and which meet the requirements of the year 10 certificate. Improve attendance through programs that increase students' sense of belonging to school community through 'giving'. Maintain students' connections to school and learning as they participate in vocational and training options. Improve physical and mental health through fitness programs including networks with external programs. As part of connecting to the community the students have been working closely with the Lions Youth Haven and participated in the 'Trees in Trouble' program. They have worked closely with key people to build fencing to protect 300 year old trees from the resident horses. During 2010 students erected seven fences and still have further work to do. We celebrated our achievements with Simon Corbell at an official launch. Trust they have developed in each other through team work and learning new skills. Respect for the impact animal behaviour has had on the environment and the need to make a difference. Empathy for the environmental factors that are sometimes sacrificed to support the cycle of life. Knowledge of 300 year old Yellow Box and Red Gum trees situated on the agistment at Lions Youth Haven and their need to be supported to survive. Since participating in the 'trees in trouble' project the students have developed an appreciation for the need to network to identify environmental issues and seek support to make a difference. 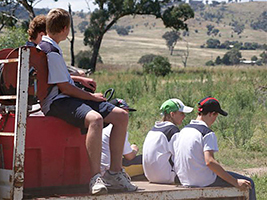 The TREK class has decided they would also like to support the Southern ACT catchment group through a local water watch program to monitor water quality in the local area. They are currently developing new knowledge about water quality and working towards ensuring local waterways is monitored. 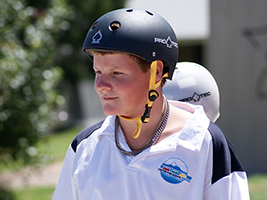 TREK is a program that is continually evolving to meet the needs of the students and school.